Check Out Some of Our Videos for the full One Man Band + Plus Experience Take Me There! One Man Band + Plus is a band based out of Monsey, NY unlike any other. Whether playing tasteful background music or making sure your guests don't stop dancing, One Man Band + Plus will exceed your expectations.Hillel Kapnick, the musician and singer behind One Man Band + Plus has been playing a variety of instruments as well as composing his own songs and singing since he first picked up a guitar. When Hillel isn't performing live as One Man Band + Plus, he is running HillelKAPS Productions, a NY based production company as well as Engineering at Uptop Studios, a recording studio also based in NY. 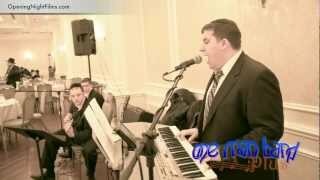 Hillel's musical and vocal talent, as well as his ability to read a crowd to determine the song selection makes him the perfect choice for any event. Hillel, I've worked with hundreds of people in my lifetime, you are a true rarity. Your unlimited patience, willingness to work with us through our many (many!) changes, attention to every detail and upbeat attitude was truly an absolute pleasure. Our wedding was a night to remember. Even the biggest critics - the teenage girls, were blown away! The singing and playing were top notch. My chosson wishes he had known of you so he could have used you by the wedding he made a few months ago. We would recommend you to all." You guys were great tonight! On behalf of the Shul, thank you for really making the evening special. The kids loved the live music and the adults enjoyed the music and the fact that you guys came out and played for the Shul. One Man Band Plus provided a wonderful and appropriate music set for our Shul's Simchas Beis Hashoeva. The music and singing were beautiful and everyone had a great time! As host of the popular SNS, I selected Hillel Kapnick of OMB+P along with singer Baruch Naftel to provide live music on the show. Hillel's knowledge of songs, sounds, keys, and music in general, brilliantly shone through his performance. Baruch's voice was the perfect combination of sweet and strong that brought each song to life. 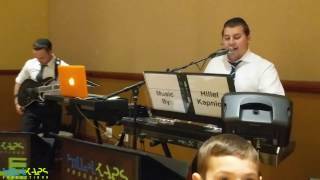 ThOne listener even booked them that night for her son's upcoming Bar Mitzvah! On November 6th, 2011 my youngest daughter got married and we used One Man Band Plus. They were so fabulous that when our next daughter became a Kallah we decided to use them again. They outdid themselves. Hillel and Baruch are fabulous. The volume was great and they sounded like a five piece band. There is no need for more than one piece. Everyone should use them. I cannot praise them enough. "Hillel and Baruch really helped to enhance our Simcha; many of our family and friends commented on the quality of the musical entertainment. Additionally, they were professional, responsive, and incredibly easy to work with. I look forward to hiring One Man Band Plus in the future!" We were very happy with the service that Hillel and Baruch Provided. The music was lively and appropriate for our Bar Mitzvah. The boys enjoyed the dancing as it was lively and fun.A lot of the boys didn't want to go home! We highly recommend One Man Band + Plus for your next Simcha! Thank you for participating in my son's Bar Mitzvah seudah. We, and the young men enjoyed the music, the singing, your enthusiasm, and the liveliness. You went above & beyond the letter of the Contract. Kol Hakavod! Hey Hillel, On Behalf of the committee, I just wanted to thank you again for playing at our reunion on Sunday. Everyone loved the music and it was the perfect set for the event. Additionally, you were a pleasure to work with.